Getting kids to love reading is difficult at the best of times. Reading is hard, particularly for children who, for whatever reason, aren’t exposed to new language or reading in the early years. By the time they arrive in secondary school, many reluctant readers hate books: they see reading as dull, pointless and arduous. One way round this is to give reluctant readers books that appeal to their interests, or are relevant to their lives. The view tends to be that so long as children are reading something, then it doesn’t really matter what it is that they are reading. In lots of schools, this means that ‘Diary of a Wimpy Kid’, ‘Guinness Book of World Records’ and ‘The Story of Tracy Beaker’ are the most popular titles. This is something I have gone back and forth on over the last few years. On the one hand, we do want children to enjoy reading, and starting them on books they like seems to be a good way to do that. But I’ve always wondered what happens next? I’ve seen kids get into ‘Wimpy Kid’ and ‘Tracy Beaker’, but struggle to transfer that to other books that might be more challenging or different. Ultimately, it is really important that children read as broadly as possible. Reading is one of the primary mechanisms we have for learning new things, and if we don’t promote wide reading in school, it is less likely that children will become wide readers in adulthood. So whilst I do think that children should be allowed to read books they like (obviously), I want to make sure that this doesn’t limit the breadth of their reading. 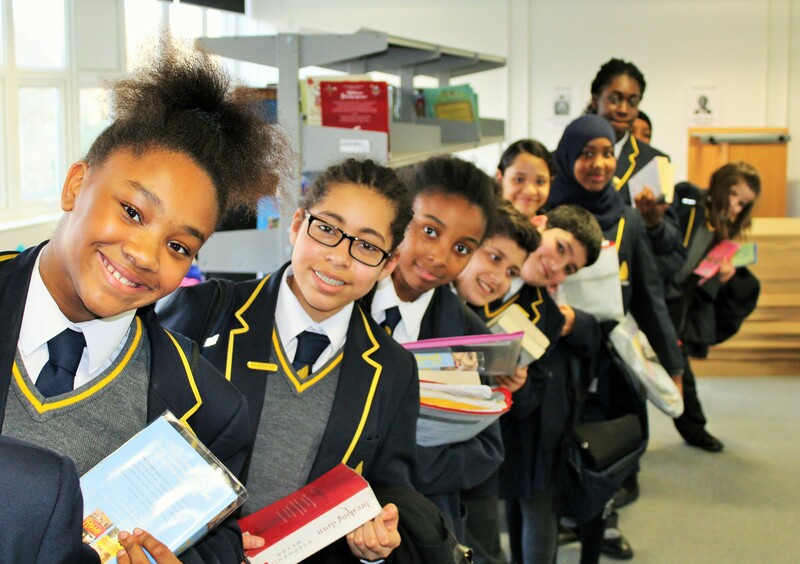 At Michaela, we have several programmes in place to support children to read as broadly as possible. At Michaela, we believe that reading is all about habit. For that reason, we read every day with every pupil. Our class reading programme is designed to give even the least able readers daily access to great works of literature. Books are carefully sequenced, and all titles have been chosen precisely because they aren’t the kinds of things that pupils would typically read on their own. We believe that reading with an adult is a powerful way to get through books that are difficult or out of kids’ comfort zones. When the class reads together, the teacher can pause and explain difficult vocabulary and concepts, and can ask questions to check for understanding. These books – titles such as ‘To Kill A Mockingbird’, ‘Silas Marner’ and ‘A Christmas Carol’ don’t tend to fly off the shelves in our school library, but pupils read them in class and, with the support of their teacher- get a lot out of them and end up really enjoying them. They may have enjoyed them had they read them alone, but it’s unlikely they’d pick them up in the first place! Class reading is a way to broaden pupils’ reading by pushing them out of their comfort zones. Our least able readers stay for 30 minutes after school every day for Reading Club. Jo Facer, our wonderful Head of English, has created a brilliant sequence of Reading Club books. These books are more pupil-friendly, with titles that are a sort of halfway house between ‘classics’ and the books they’d pick up on their own anyway. They tear through ‘The Red Pony’, ‘Farenheit 451’, ‘The Woman in Black’ and many others. Again, these books are challenging for the least able readers, but with the support of their teachers, are made more accessible. Importantly, this means that the least able readers in the school are reading the most books with adults, and are reading even more broadly than other pupils. Jo Facer came up with this brilliant idea. We found that lots of pupils (of all abilities) were struggling to choose books from the library. Jo suggested that we recommend our classes one book every Friday. These are from all sorts of genres and appeal to a wide variety of interests. So far, we’ve had ‘A Tree Grows in Brooklyn’, ‘My Sister’s Keeper’, ‘Gone Girl’ and many others. We hold the book up, talk about it a bit, and then it goes in the library. At lunchtime, loads of kids turn up to grab one of the coveted ‘Friday Read’ books. Following the Class Reader theme, we have lots of full class sets of books in the library that pupils can take out together and read in groups. These are called ‘Team Reads’. These are a mixture of classics and modern novels, and pupils are welcome to come in to the library at lunchtime and read them together, or take them home to read and discuss. If you’re stuck for resources on this one, check out the Penguin Classics offer for schools– you can get loads of books for a relatively low sum. Finally, our pupils are all expected to have a library book with them every day. They read this in silence in morning tutor time and at home in the evenings. This gives kids the flexibility to choose anything they want to read. Interestingly, pupils often choose books related to the topics they are studying in lessons. So we see lots of kids reading about Ancient Egypt or Astronomy, for example. ‘Tracy Beaker’ is still popular, but lots of our pupils challenge themselves to read more widely and push themselves out of their comfort zones. Thank you. I absolutely love the Reading Club idea. Starting sessions such as these with our most needy pupils right from the off ( Autumn clubs rather than Spring boosters) would give them the skills they need, the breadth of quality literature and the support in a purposeful atmosphere of learning and enjoyment of books. Nice and very Informative blog. Thank you Mr. Admin for your blog.